(Hamilton, OH)- The Butler County Prosecutor’s Office received one of fifty-four grants awarded by the National Association of Drug Diversion Investigators (NADDI) and sponsored by Purdue Pharma, LP to help address the complex problem of prescription drug abuse and diversion. 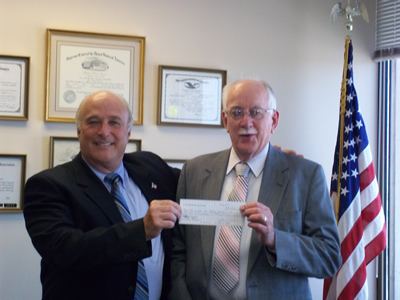 This $5000 grant was awarded to the Butler County Prosecutor’s Office based upon the outstanding investigative efforts of Robert Mortimer, who is employed by the Prosecutor as a designated Secret Service Officer. The grant program is designed to recognize law enforcement agencies that have achieved excellence in the investigation of pharmaceutical abuse. The grant could not come at a better time as funding for clean-up of illegal pharmaceutical production laboratories has dried up and this resource can now be used to assist when those laboratories are discovered and require dismantling by law enforcement. Investigator Mortimer works closely with the D.E.A. and has been extremely successful in identifying and bringing to justice those who abuse the pharmaceutical laws.